Tree nuts are an important food source worldwide as well as one of the most common food allergies. Approximately 1 in 20 Americans is allergic to tree nuts. There are a number of different types of tree nuts, and the cross-reactivity between them is high, especially if you have a tree nut allergy. Just because you are allergic to one tree nut does not mean you won't be able to eat another tree nut. However, most people with a tree nut allergy are allergic to more than one tree nut. Peanuts are very different from tree nuts since they are actually a legume, rather than a true nut. However, research shows that up to 50 percent of people with peanut allergy are also allergic to at least one tree nut. Symptoms of tree nut allergies are the same as other food allergies, although tree nut allergy symptoms tend to be more severe. If you are allergic to tree nuts, your doctor will advise you to avoid all tree nuts as part of your treatment plan. Should you eat a tree nut and have an allergic reaction, you may need to use injectable epinephrine and antihistamines. Unlike other common food allergies, you are less likely to outgrow a tree nut allergy, especially if you experience severe allergic reactions. Below are some potential tree nuts you may be allergic to. Walnuts. Walnuts are the most common type of tree nut allergy, especially English walnuts. If you are allergic to walnut pollen, you may experience symptoms of allergic rhinitis. However, just because you are allergic to walnuts doesn't mean you are allergic to tree nuts. Walnut allergens are similar in structure to those found in pecans, cashews, Brazil nuts, castor beans, cottonseed, and mustard. 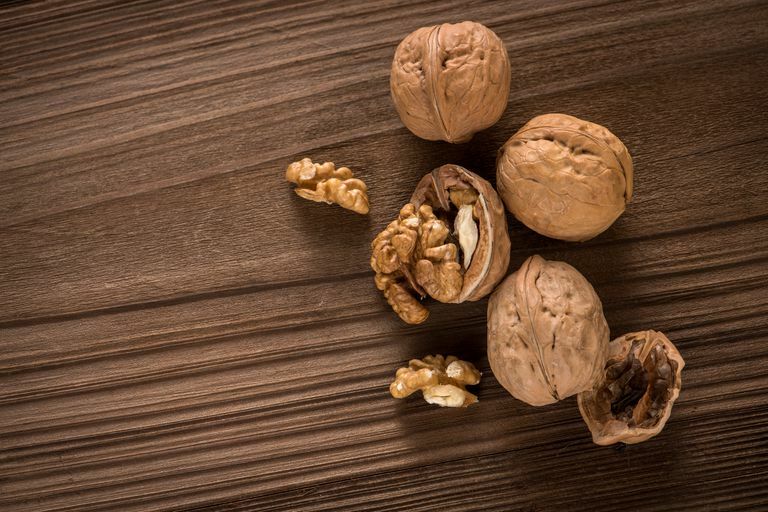 If you have a walnut allergy, you may also experience allergic reactions to these other foods. Cashews. Cashews are the second most common allergy-causing tree nuts. The oil found in the nutshell of the cashew is known to cause contact dermatitis and is related to the oils found in the leaves of poison oak and in the skin of mangoes. Cashew allergens are similar to palm oil, macadamia nuts, peas, soybeans, and walnuts. If you have a walnut or cashew allergy, you may also experience allergic reactions to these other foods. Almonds. Almonds are the most popular tree nut consumed in the United States and the third most common tree nut allergy. Almonds are commonly used when processing food and are unexpected ingredients in breakfast cereals, granola bars, and baked goods. Having an almond allergy may predispose you to other tree nut allergies, especially pistachio nuts. Pistachios. Pistachios commonly cause food allergy symptoms and are cross-reactive to cashews and mangoes. Hay fever to the pollen from the Parietaria weed, found in Europe, appears to predispose to pistachio allergy. Hazelnuts. Allergy to hazelnut is more common in Europe than in the United States. Hazelnut pollen is a common cause of seasonal hay fever. If you have a hazelnut pollen allergy, you are also at risk for a food allergy to the tree nut itself. Hazelnuts are also related to birch pollen. If you have a birch pollen allergy, you may experience oral allergy symptoms with eating hazelnuts. If you have a hazelnut allergy, you may also be allergic to coconut, cashews, peanuts, and soybeans, given the similarity between the allergens in these foods. Pecans. Pecans are a common food in the southern United States, but less common elsewhere in the world. Approximately 1 in 10 people with tree nut allergies will have a reaction to pecans. If you have a pecan allergy, you may have a walnut allergy as well, given how similar allergens in the two nuts are. Chestnuts. If you have a latex allergy or an avocado allergy, you may also have a chestnut allergy given the similarity between the allergens found in latex and these foods. Mugwort pollen, apples, and peaches may give you a reaction as well if you are sensitive to chestnuts. Brazil nuts. Brazil nut allergies are not common, which may be due to their lack of popularity in the U.S. Brazil nut allergies may increase in the future since genetically modified soybeans accidentally have proteins similar to those found in Brazil nut allergen. If you are allergic to Brazil nuts, you may also be allergic to walnuts. Pine nuts. Pine nuts are a common food in southern Europe, but less common in other parts of the world. If you have a pine pollen allergy, you may be allergic to pine nuts, given that the allergens are similar. Macadamia nuts. Macadamia nuts are common in Hawaii and the tropics. There is significant cross-reactivity between the allergens in macadamia nuts and cashews. Therefore, if you are allergic to one, chances are you'll be allergic to the other. Coconuts. Coconut allergies are rare ​and are only distantly related to other tree nuts. However, the coconut allergen is similar to those found in hazelnuts and walnuts. Roux KH, Teuber SS, Sathe SK. Tree Nut Allergens. Int Arch Allergy Immunol. 2003; 234-244.